The Great Sand Dunes are highlighted in the setting sun at the base of the snow-capped Sangre de Cristo Mountains. Great Sand Dunes National Park is a destination for many guests staying at the Delightful Dome in Crestone. Crestone is located beneath the rugged peaks on the far left in the photo. The highest dunes are 700-800 feet tall! En route to the Sand Dunes are several notable attractions. Click the location map below for a Google summary, and see the information below. The Sand Dunes Loop Trail is a great 5-mile hike, and the 650-foot tall High Dune is a worthy destination! All Trails Website. Sand Dunes Hot Spring Pools near Hooper are in an adult-only greenhouse (yes, there is a bar!) – a nice way to finish the day! Watch for the turn off Rt. 285 just north of the Hooper gas station. May be closed one day each week. Website / See our post, Hot Springs Near Crestone. Colorado Gators Reptile Park near Mosca is a very cool place! Website. Zapata Falls south of the Sand Dunes is best during the warmer months (summer and fall). Website. UFO Watchtower in Center. Quirky and eccentric, but hey! Website. 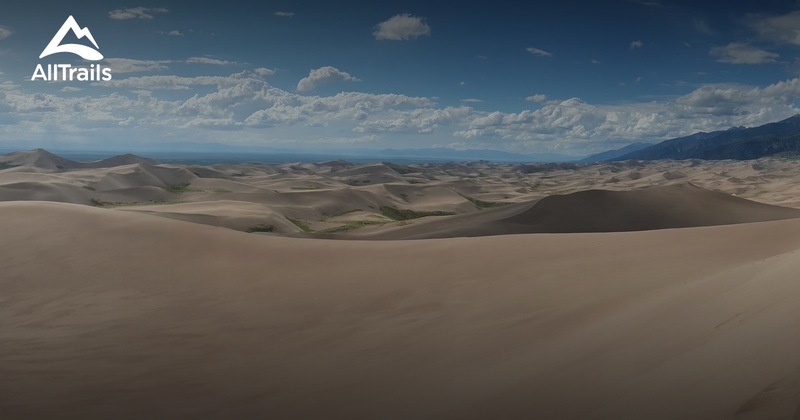 The tallest dunes in North America are up to 750 feet tall and neighbor grasslands, shrublands and wetlands. They were formed by sand deposits of the Rio Grande on the San Luis Valley, and the park also has alpine lakes, six 13,000-foot mountains, and ancient forests. Please get in touch with any questions about your trip. We love this area!